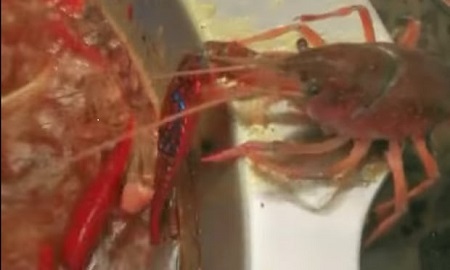 A crayfish who sacrificed its own limb to survive an encounter in a pub with a vociferous Brexit fan has become an online hero. Footage shows Colin the crustacean wedged in at the bar next to a tweed-suited Nigel Farage wannabe, before detaching one of its own claws to make a bid for freedom. At first the tasty shellfish can be seen trying to deflect his assailant with a combination of uncomfortable body language and grunting, but the right-winger‘s first use of the phrase “political correctness gone mad” was enough to convince it that the loss of a claw was a small price to pay. As the sounds of “I’m not racist, but some of them…” rang behind it, the crayfish hobbled quickly into the pub kitchen, seeking the back door and a handy stream behind the building. It was only to find itself trapped again when Mr Brexit, apparently oblivious to its discomfort, followed it into the kitchen and began extolling the mercantile opportunities of the Commonwealth. At this point the crayfish realised the only option left to it was to hop into the boiling pan of soup bubbling on the stove, thus ending its torment forever. Mystified, the Brexit lover returned to the bar to widen his audience, only to be surprised by a stampede of customers also rushing for the kitchen to dive into the sweet release of death by boiling.